NASA successfully launched a set of twin spacecraft into orbit today (Sept. 10) to study the moon's gravity, but the new mission isn't the first — or the last — robotic planetary expedition for the space agency year. The two Grail spacecraft launched toward the moon from Florida's Cape Canaveral Air Force Station to begin a 3 1/2-month trip to lunar orbit. The liftoff came just one month after another NASA observatory launched toward Jupiter to study the gas giant's composition and atmosphere. That flight, the Juno mission to Jupiter, is also expected to beam back the best photos yet of the solar system's largest planet. The $1.1 billion Juno mission is expected to arrive at the giant planet in July 2016. And NASA's not done yet. In late November, NASA will launch the sophisticated Mars Science Laboratory (MSL) mission toward the Red Planet. The centerpiece of the ambitious MSL mission is a Mini Cooper-size rover named Curiosity, which will roam the surface of the planet searching for clues of its wet past and potential habitability. The $2.5 billion Curiosity rover will land in Gale Crater, a 96-mile (154-kilometer) wide scar in the Martian surface that has a central peak which rises higher than Mount Rainer near Seattle. The states of Rhode Island and Connecticut could fit inside it. But Curiosity needs to launch into space first before even contemplating its Mars mission. So for today, all NASA eyes were on Grail moon probes. NASA's new mission to the moon continues in the footsteps of previous robotic and manned lunar expeditions, but the Grail probes are expected to greatly expand our knowledge of Earth's natural satellite. The $496 million Grail mission will precisely and accurately map the moon's gravitational field. The probes will also peer inside the moon and examine its composition, from crust to core, and attempt to piece together its evolutionary history. Observations from the Grail spacecraft will also help researchers understand how other large, rocky planets in the inner solar system formed and evolved. The probes, called Grail-A and Grail-B, are embarking on a circuitous and energy efficient path to the moon. The spacecraft are expected to arrive at their lunar destination by New Year's Day. The three-month science mission will begin in early March, when Grail-A and Grail-B begin collecting data. In the meantime, students of all ages across the U.S. are invited to enter a contest for more creative names for the lunar probes. NASA will announce additional details about the naming contest soon, but Zuber explained that students will be invited to submit essays explaining their choice of names. The contest will run from Oct. 14 to Nov. 11, and the winning names will be announced before the Grail spacecraft reach lunar orbit. Today's launch came after windy weather and a technical glitch postponed Grail's liftoff by two days. Even this morning's success was not without its share of suspense. 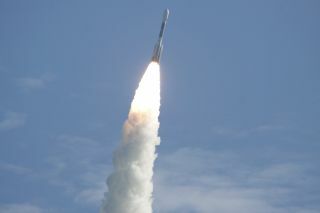 The probes blasted off at 9:08 a.m. EDT (1308 GMT) from Florida's Cape Canaveral Air Force Station, but high-altitude winds forced the agency to stand down during an initial attempt earlier this morning. "That was the most drama, I think, of the entire day," Zuber said. "It was such a relief once we got the 'go' to launch … that I was extremely calm during the launch."